I have been teaching a chakra series which has been very educational for me. Going through the chakras week by week has taught me a lot about my own personality and where my places of comfort and insecurities lie. However I have been feeling that as a whole the class series hasn’t felt balanced in the way I wanted. The first classes have been more active, the latter classes get pretty quiet. There hasn’t been consistent feel throughout the series. I wonder how this feels for the students who do drop in and don’t come to every class. They don’t seem to mind but I can see how it might be a little jarring. I also find I get a bit stuck for ideas when I get to the higher chakras. For instance how does one teach the crown chakra in an asana class? It really has nothing to do with the body or postures at all. I have been incorporating mediation for the last class quite heavily which seems to work but the whole series doesn’t flow together in the way I want it to. I think I am going to switch things up a bit. 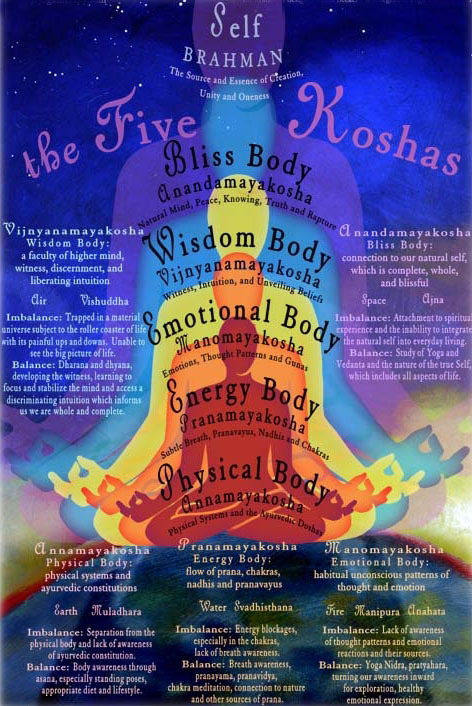 I have noticed that many of the teachers that I am inspired by incorporate the koshas into their classes. I would like to experiment with these “layers of being” in my next class series and see how it feels. I am grateful that I have one day a week of teaching where I get to play like this. My Sunday classes are a bit of testing ground where I get to explore different ideologies and teaching styles. I learn so much more about yoga when I get to experiment.